The MEDLIT-project was established in Mid-October 2015 by a grant from the EACEA within the framework of the Erasmus+ programme, specifically the KA2 part Capacity-building in the Field of Higher-Education. Activities started in January 2016, shortly after the grant agreement was signed. Because of this delay and other adaptions to reflect changing overall conditions, the project consortium applied for a project extension of five months. The project ended in Mid-March 2018, resulting in 29 months of project duration. Why did we do the project? The overall aim of the project was to build the foundation for more media literate societies in South East Asia (beginning with Malaysia, Thailand & Vietnam) in order to cope with the challenges of social change in modern societies. Important drivers for such transformations are media effects on social practice (mediatization and medialization), influencing culture, economics, politics, and other societal spheres. Changing the system: In contrast to many other programs that deal with these phenomena by focusing on digital literacy skills like programming, media production, and education to tackle problems like fake news, filter bubbles & hate speech – this project operated on a more comprehensive level. To use a metaphor: Focussing mainly on skill training is like managing the apps on a smartphone. This may be a quick fix, but it is mostly fighting the symptoms while being limited by the possibilities of the underlying operating system. Instead, the project aimed at a transformation of the operating system itself, by using Higher Education Institutions as places to connect important stakeholders within these societies to think about arising needs as well as societal and cultural goals in the face of global and local developments. 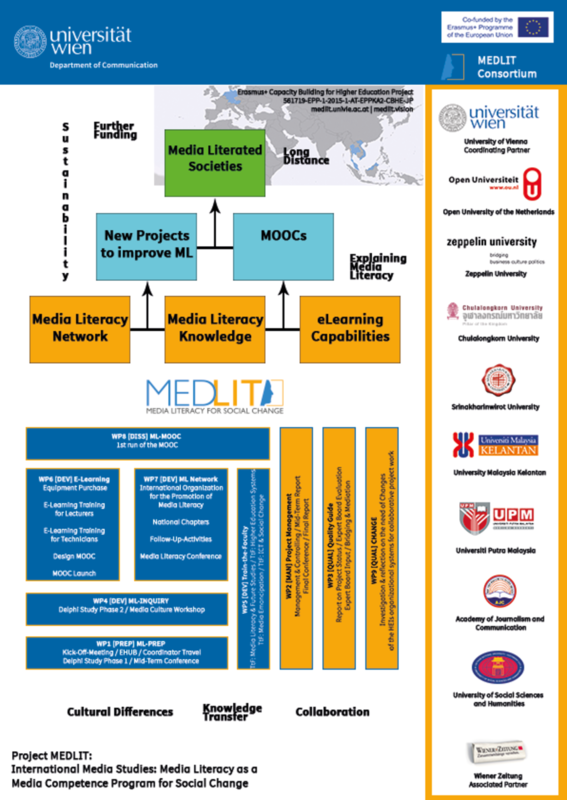 An Action-Research oriented Delphi Study to do research on the current knowledge and future demands of Media Literacy combined with the attempt to find and activate stakeholders was conducted. This made it possible to incorporate the desires and needs of stakeholders beyond the higher education system.